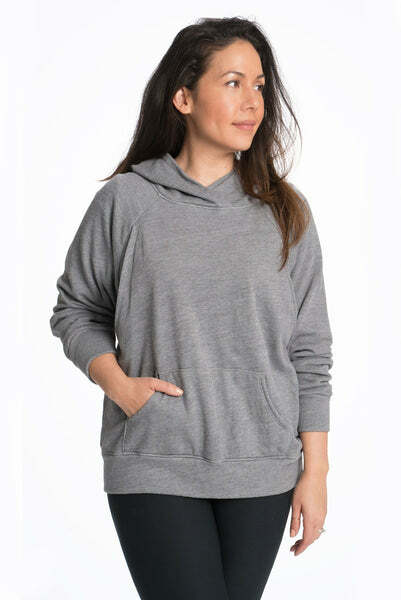 Breastfeeding is super easy in this slouchy relaxed fit hoodie. Not to mention it's so super soft for extra snuggly time with baby. Access the nursing utility through either side. We love this top with a stylish athleisure look (mom uniform everyday haha!) or with jeans and some Converse kicks. If you are exclusively breastfeeding and would actually like to leave the house, this is a must. We go any where and I can seriously, comfortably feed my baby and be covered. It's easy to feed using this sweater. Very true to size with a loose style of fit. I'm 5'5" 160lbs wearing a medium. This was a great purchase, sweater is great quality and super comfy. Love it will definitely be purchasing another one. Love this sweatshirt. Super comfy and very easy to breastfeed in. This is my second one. Only disappointed with the shipping. It seemed to take about a week to process before it even left the warehouse. Sweatshirt is very soft and comfortable. Being a staple item, I’ll be able to get a lot of use out of it. I have heard some of the stitches rip as I’ve pulled it over my head but everything appears to still be in tact. I think this was a bit more expensive than it was really worth (and that was using a coupon). I would never pay full price for this. I own two of these and absolutely love them! They are so comfortable and so easy to use. They are the perfect hoodies. Thank you Michele! This is wonderful news that the hoodies have been working for you! This feedback is encouraging to keep serving you the best ways possible!